A NUMBER OF Roma players have been warned to “sleep with the lights on” following the club’s defeat to Lazio in the Rome derby five days, while dummies have been seen hanging close to the Colosseum. Luciano Spalletti’s men, who had Antonio Rudiger sent off in the final stages of the Derby della Capitale last week, were on the receiving end of a 3-1 defeat to their bitter rivals. Now, just days later, three dummies have found hanging in the streets of the Italian capital, donned in the jerseys of Daniele De Rossi, Radja Nainggolan and Mohamed Salah. With the hanging figures was a large banner, stating: “Un consiglio senza offesa… dormite sempre con la luce accesa”, roughly translating as “Some advice with no offense… always sleep with the lights on”. The threats also come just a day after Italian Parliament approved a new law in regards to self-defence, which now authorises people to defend themselves in their property overnight if an aggressor breaks and enters. 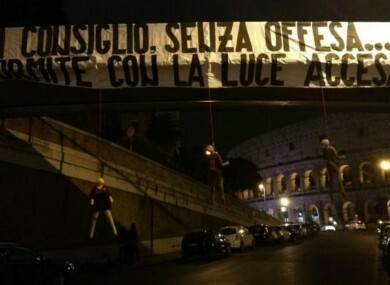 Email “Dummies of three Roma players found hanging in the streets after derby defeat to Lazio”. Feedback on “Dummies of three Roma players found hanging in the streets after derby defeat to Lazio”.